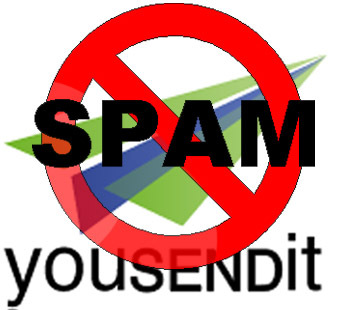 Received from an editor a file through YouSendIt today and I was confronted again with the aggressive SPAMMER tactics of this enterprise… Now they suggest you to NOT download anymore but keep files available on-line… “free” it says… but filling in their “free” form means being exposed to endless SPAM messages of their only so many days options. Now the classic download is almost hidden and sometimes the clickable download button does NOT work anymore… though savvy as I am, I use a Control Click which gives me a classic download. It is a shame, a service that is so aggressive and misleads its customers. I prefer the free low key service of wetransfer.com (up top 2 Gigabyte files, multiple files automatically zipped, no spam – until now) that shows only big advertisement pictures during up or download.